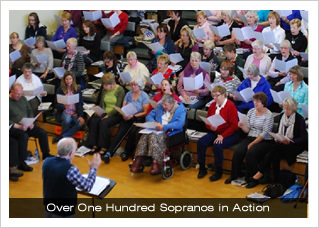 Earlier today the Northamptonshire Choral Foundation organised a “come and sing” day with the internationally-acclaimed composer and conductor, John Rutter. 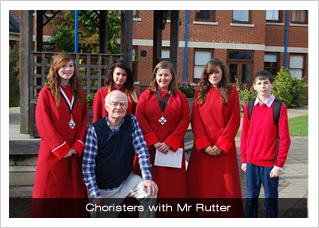 This is the third time that Mr Rutter has directed this event for us, and we were delighted that a number of our choristers, scholars and lay clerks were able to join over two-hundred and fifty singers from around the County and further afield. Former Director of Music at All Saints, Ian Clarke, accompanied on the piano, having been a student alongside Mr Rutter in Cambridge. All the organisation on the day was executed by a team of chorister parents, who made light work of distributing (and collecting back in) the best part of one tonne of music, and making over five hundred cups of tea and coffee. 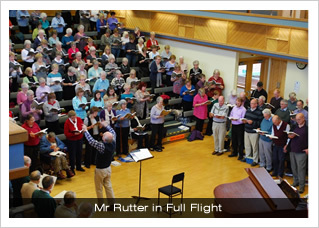 The singers worked on Rutter’s own This is the Day, written in 2011 for the wedding of HRH Prince William of Wales and Catherine Middleton, and The Gift of Charity, written for the 2010 Michaelhouse Festival. Alongside this they sang selections from a new Oxford University Press volume of English Church Music, including Howells’s Like as the hart desireth the waterbrooks and Tallis’s If ye love me. 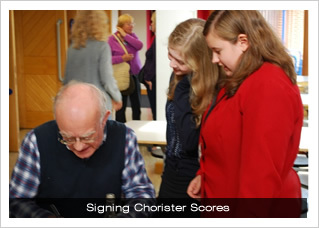 A number of the choristers brought their Rutter CDs and scores with them, and had them signed by the composer himself. We offer grateful thanks to Mr Rutter for his wonderful direction, to Mr Clarke for his excellent accompaniment, to the Northampton High School who hosted the event, and to all who helped organise this splendid day, not least our choir parents..